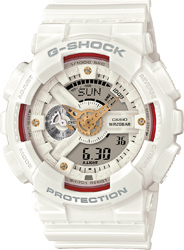 From G-SHOCK, the watch whose designs are a blend of cultures from around the world, and BABY-G, the casual watch for the active woman of today, come new his and-hers paired models. 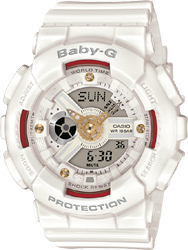 Base models are the G-SHOCK GA-110 big case model and the GA-110-inspired BABY-G BA-110. Both models combine various parts into complex patterns. For these models, a basic white coloring is highlighted by red and gold accents. 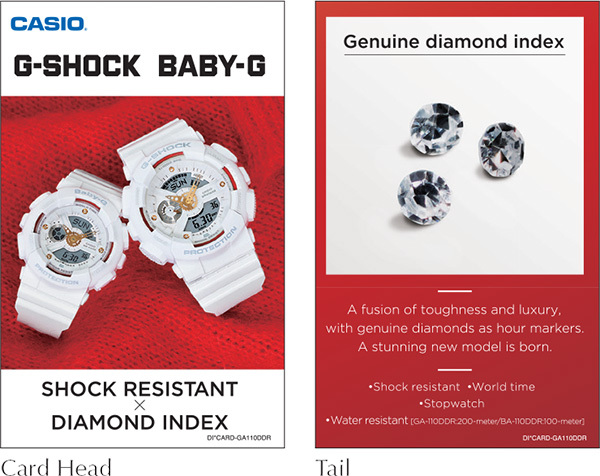 The back covers and buckles of these models have a gold ion-plated (IP) finish, and they sport diamonds on the face at 12, 3, 7, and 9 o'clock. These models highlight the wrist with bright and sparkling fashion. This new his-and-hers paired models add a fashionably casual accent to the wrists of whoever wears them.